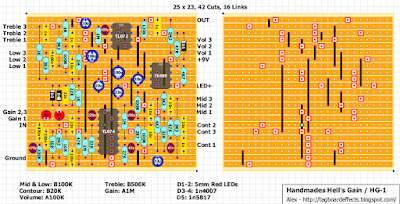 It's a diy Marshall emulator designed on Handmades Brasil forum. Thanks Alex. Will give it a go at the weekend. I've just seen the Menatone None More Black schematic. Do you have the final correct version? Any chance you have it black on white and larger? Can't read the components values. It looks like there is a ton of good information especially on the pdf download. But I don't, and probably most of us here, don't speak or read Portuguese. And ... I'm certainly not complaining. Glad we have it because I really appreciate the schematic(s) that Alex (& the rest of the crew) posts or directs us to with his/their layouts. Maybe someone could translate some of the more important parts and put that in the comments. maybe a trade, if you have something important that the Google translator has f'd up with ??? There's a corrected PDF on the FSB link. I have a Portugese work colleague who is translating the PDF for me. I'll post it as soon as she is done. Is it just me, or does that demo make this thing sound more Marshally then a lot of more... commercial products? 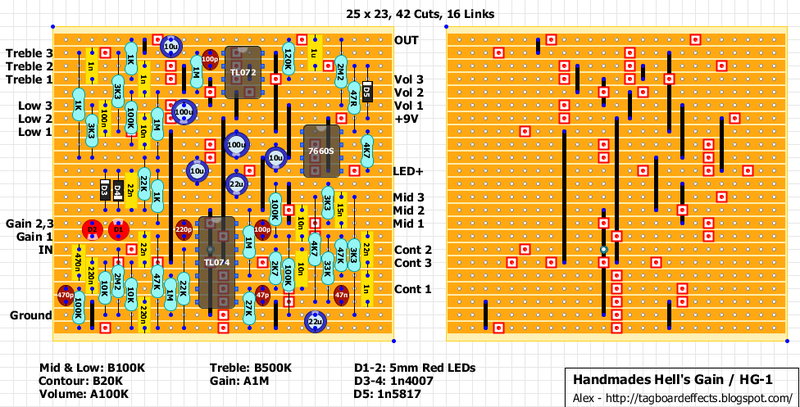 Ok PDF translation turned out to just be how to populate the PCB board and the types of jacks to buy etc. No real information on the circuit apart from this little bit at the beginning "The pedal herein described has diverse characteristics that will make the guitarist very happy: moderate to high gain, detailed and acting equalization, high exit capacity, allowing it to be used at setup as a distortioner and booster at the same time; plenty of buttons (most really like buttons); Marshall distortion model; compact; etc." Also they added this "The circuit herein presented is of the authorship of Haroldo Gamal and is part of the collection of projects of the forum handmades.com.br, with no restrictions about its commercial or private use." How is the status LED connected? Negative to the 3PDT and the positive only to the board? Or the positive from the board has to go also to the power supply? Thanks.. Negative to 3PDT and positive to board. Thank you everyone that worked on the translating and making available the information in the pdf file. I'm sorry it took me so long to comment back but because of weather I've had no internet connection for the last few days. This is a perfect example of what a great community we have and how terrific & informative this blog really is. I'm sure that I'm only one of very many that have learned & benefited a great deal by reading & participating in the products of this great web site. Verified! This is a brilliant pedal and sounds very similar to the YT vid. Definitely worth a build IMO. Hats off to the guys at the Handmades Brasil forum, they really have created a masterpiece with this one. Thanks Alex! Contour controls the mid frequency, right? Or is more of a presence control? Im having troubles with this. I get a high pitched whine constantly. I have cut my linkins even replaced parts where i thought the problem would arise from. Looking at the part list from this- http://www.handmades.com.br/HellsGain-HG1.1.1.pdf it looks like there are values missing and different. Can anyone help me or rewrite this scchematic correctly?? Whats that dot below the TL074 in the link, between the 2 cuts? Both lower and upper links join in the same hole.